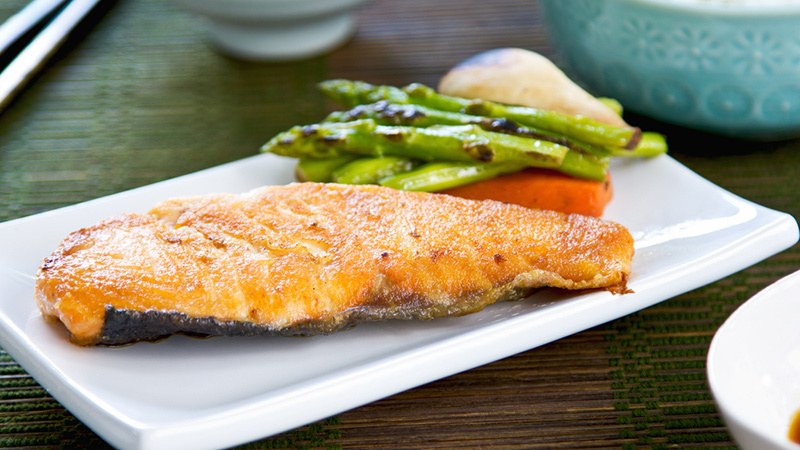 Fish is an excellent addition to any healthy diet. Boasting less saturated fat than most meats, many fish are high in omega-3 fatty acids, which can improve your heart health and provide numerous other health benefits. There a countless ways to enjoy healthy fish and seafood dishes, but here are 10 of our favourites. 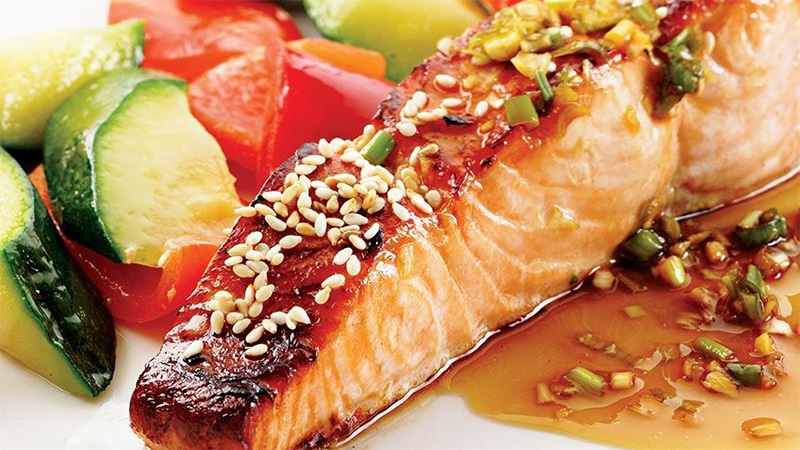 This recipe involves a sweet-yet-tangy sauce and marinade that will delight your tastebuds. Spinkle on sesame seeds and serve with brown rice for a memorable meal you’ll want to make again and again. Get the recipe from Eating Well. 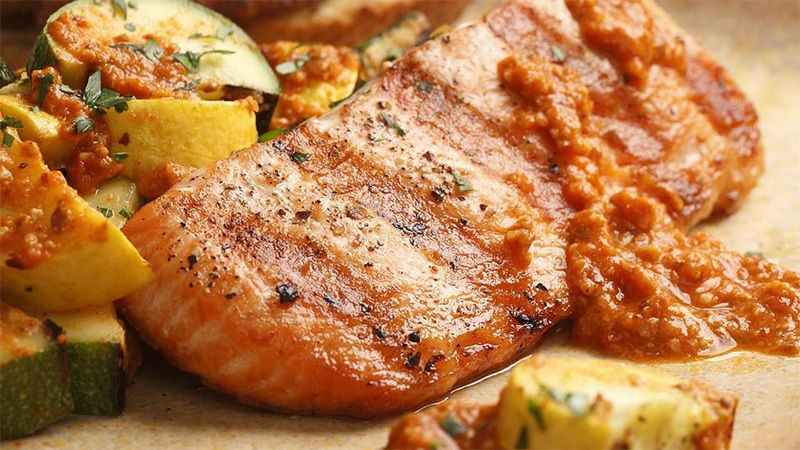 For a recipe with a bit of a kick, try this spicy salmon dish. Grilled zucchini compliments the savoury salmon filets, and a sauce made from red peppers, almonds, and tomatoes bring the whole meal to life. Try the recipe at Fitness Magazine. Begin with fresh halibut steaks, then top with a delicious Italina-inspired blend of zucchini, onion, and garlic, and feta cheese cheese for a healthy meal you and your family will love. Serve with a side of potatoes and veggies for a complete meal. Get the recipe at All Recipes. Try this Japanese-inspired dish for something a little different. Toasted sesame seeds, cilantro, and scallions complete this savoury and juicy meal. Get the recipe at Fitness Magazine. Shrimp rolls of the sandwich variety (or prawn rolls as they are known in some parts of the world), have a reputation for being an unhealthy, but delicious takeout meal. You can make this healthier version at home (and you might even like it better than the deep-fried version). Get the recipe at Health Magazine. 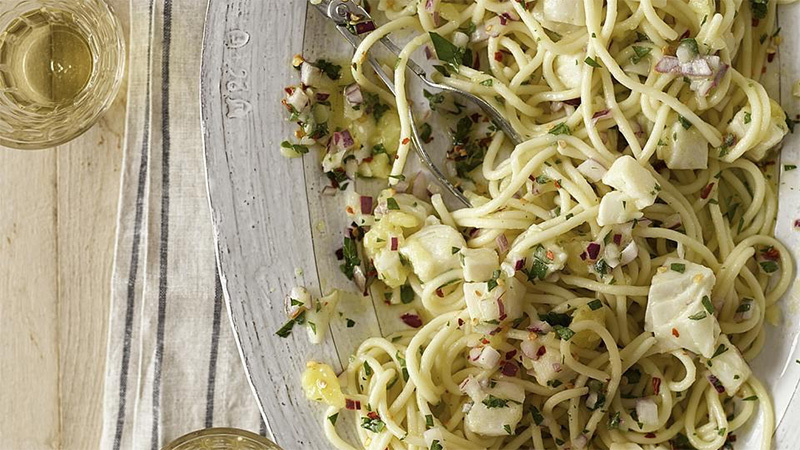 This is a quick recipe you can make with halibut and some pasta. The zesty lemon sauce is the star of this dish, which is hearty yet light all at once. Serve it with a fresh salad for a healthy and wholesome evening meal. Get the recipe at Eating Well. 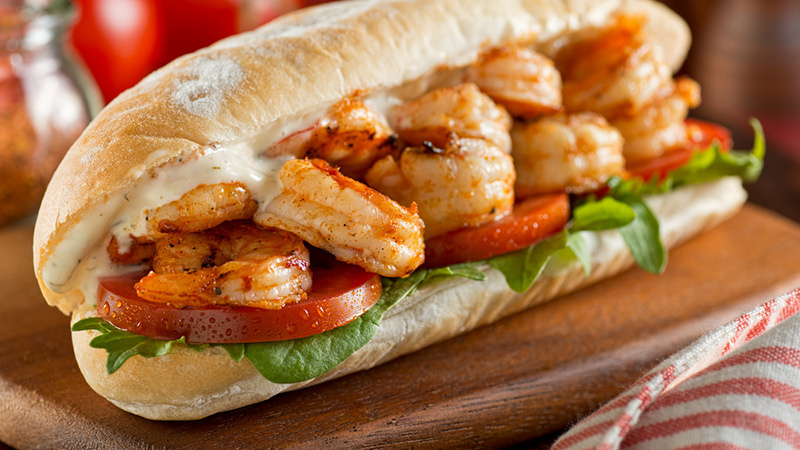 Another super-easy dish, this shrimp recipe will quickly become a family favourite. 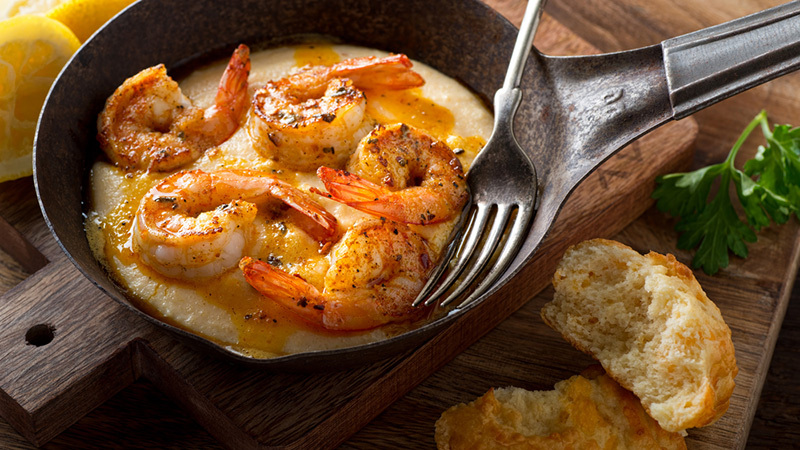 Throw in a little cayenne pepper to turn up the heat spice, and serve over grits for a filling, cajun-inspired meal. Get the recipe at Food Network. Sick of salmon? 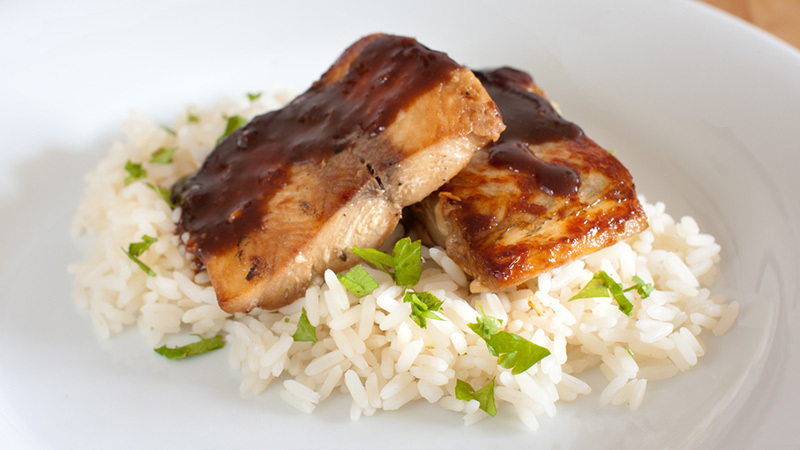 For a meal that is both sweet and sour, try this delicious mahi mahi dish that can be prepared in 30 minutes or less. 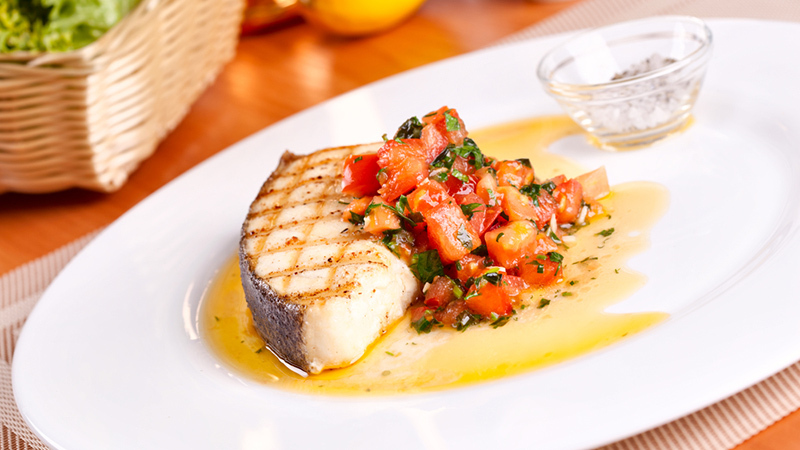 Mahi mahi has lots of protein, B vitamins, and Iron, so it’s tasty and good for you. Get the recipe at All Recipes. This is a Moroccan dish served on special occasions. 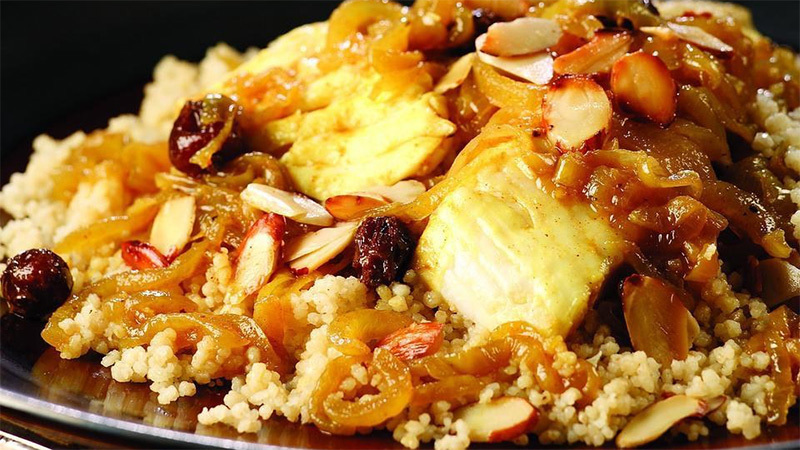 It’s sweet sauce, which features caramelized onions, slivered almonds, turmeric, cinnamon and nutmeg, is the perfect compliment for the light and fresh halibut paired with a hearty couscous. Get the recipe at Eating Well. 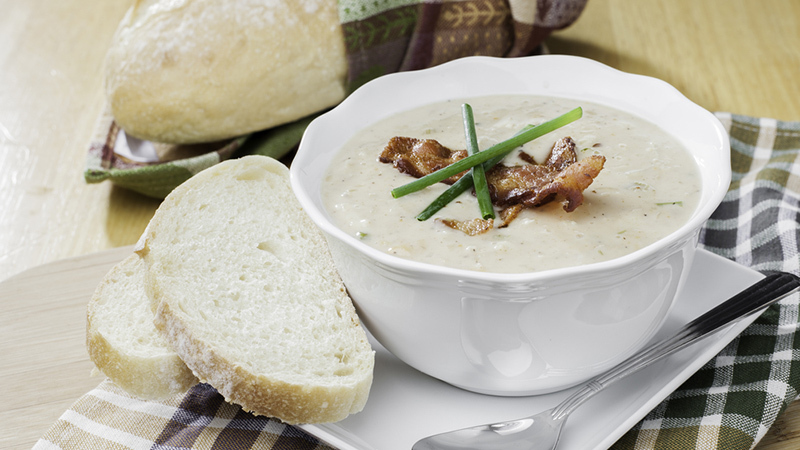 Everyone loves a comforting bowl of clam chowder. This version features halibut instead of clams, and is every bit as tasty. You can include bacon for a smokier flavor, or leave it out for a lighter dish. Get the recipe at Health Magazine.